When it came to modellers wanting particular kits reissued, one that was way, way, near the top for car enthusiasts was a strange ‘show rod’ produced by Monogram in 1969. 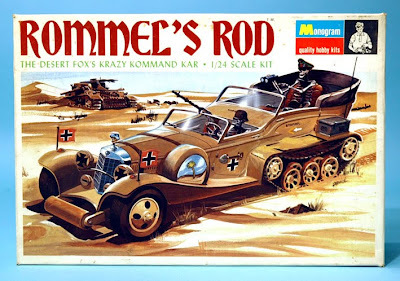 Designed by famed custom car designer Tom Daniel, who had created many of Monogram’s other wacky creations, Rommel’s Rod was a take on what the World War II ‘Desert Fox’ Field Marshall Erwin Rommel should have driven, or be driven in, during his battles with Allied forces from 1941-43. 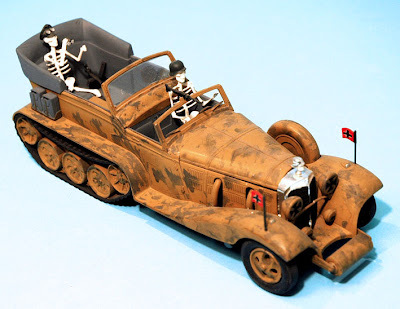 Based (very loosely) on Rommel’s personal Mercedes-Benz half-track, Daniel’s design is ever weirder in that Rommel and his driver are represented by skeletons, maybe risen from the ever-shifting sands of the North African Desert! 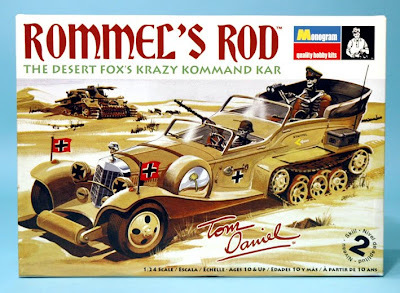 Rommel’s Rod was one of Monogram best-selling show rods, and when the combined Revell-Monogram company started the Selected Subject Program (SSP) range in 1992, the ‘Krazy Kommand Kar’ was definitely slated for reissue. It was consequently listed in SSP Phase 4, dated Fall 1993, but then came a slight snag. Having announced it, the tooling couldn’t be found (it happens more than you might think), so it became one of three SSP kits that were announced, but never appeared. 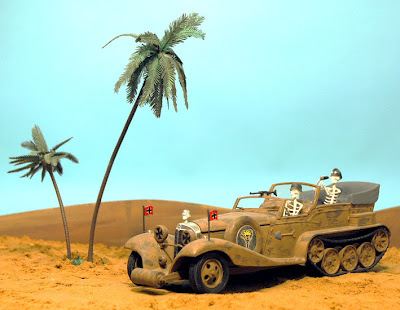 But the idea never went away, and perhaps influenced by a Moebius Models proposal for a giant 1:12 scale Rod, Revell-Monogram did its own retool, so now we have a brand-new 1:24 scale Rommel’s Rod kit to build. Purists and collectors note though - the new kit is not absolutely identical to the old one, as the opportunity was taken to modify some parts, including details such as the shovel that hangs on the driver’s door now being a separate item, instead of being moulded into the door panel as the original. But overall, Rommel’s Rod looks much the same as it did in 1969 - or should that be 1941? Rommel's Rod is available in model stores, and online here. 1 The new box features a prominent Tom Daniels signature. 3, 4 Two views of the Rod, including a diorama I made specially for it. Palm trees from Britains, sand from a builder’s yard. 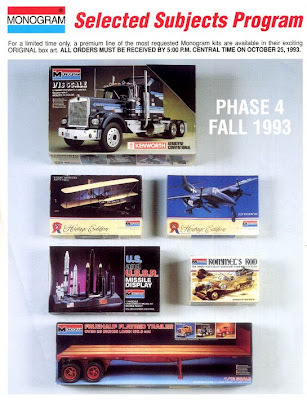 5 The Monogram SSP Phase 4 range in Fall 1993 advertised the Rod, but it wasn’t released. Sample kit supplied courtesy Revell-Monogram.